There are some events, conferences, & festivals in our portfolio that we are lucky enough to get to work on as they develop from year to year. 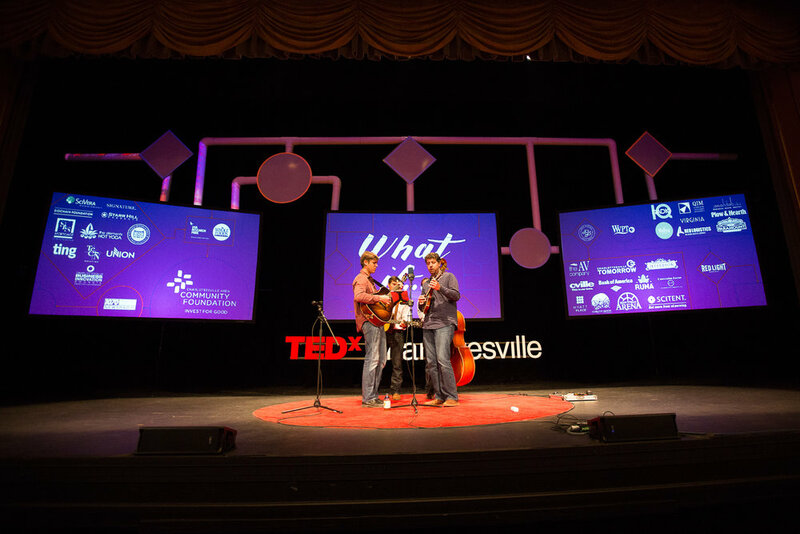 One of our favorites is our local TEDxCharlottesville event! This is such an important event in our community and the speakers are always top-notch, so it's a welcome annual challenge to design an interesting stage set that serves this event's functions while helping to enhance the theme or underlying tone of the day's presentations. For TEDxCharlottesville's first year, we kept the staging rather minimalist & clean. This was our first go at projection mapping, so we went with some simple vertical rectangles to project content onto, and splashed colorful lighting onto the backdrop to create an engaging tableau. The next year, we took the projection mapping up a notch, using Wafer panels from Atomic Design to fill the stage and create a showstopping, high-impact backdrop. Jonah Tobias, a local animator & leader of the TEDxCharlottesville design committee, created beautiful projection content that complemented the tone of each talk. In its third year, we took a nod from the poster artwork, creating a more literal representation of the event's branding. We built custom set pieces from pipe and acrylic shapes, onto which we projected the speakers faces along with ambient content. We also used three projection screens to accommodate speaker content while keeping informational slides visible during each talk. In 2016, we switched it up and used our Absen LED panels instead of projection & screens. We placed one large LED wall with picture-in-picture graphics in the center of the stage, and used additional LED panels to construct realistic-looking "wooden" stage decor. Finally, this year we went back to basics with a single projection screen and two analog sculptural set pieces. The structure of the set pieces was an exact replication of this year's branding illustrations, and the pieces made a strong statement among an otherwise pared-down stage set. We're honored to have assisted with this event since its inception, and our long-standing relationship & close connection to the show allow us to create innovative sets while maintaining a thread of stylistic continuity from year to year. To see behind the scenes of some past tedx events, head over to our portfolio page!